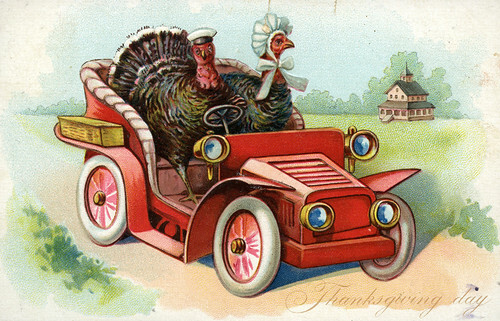 Next week is Thanksgiving and millions of Americans will be traveling to spend the day with family or friends. The process will be repeated again for many a few weeks later for Christmas and New Year’s gatherings. Our family is no exception as we have travel plans for both holidays! For everyone involved, holiday travel can be a challenge due to the volume of travelers and weather. There’s no guarantee, but you can better your odds with these tips. If you’re flying, the best day is the actual holiday. We did this a few years ago and had very empty flights and airports. It was like hitting a black Friday sale right after the crowds left. Whatever you do, don’t travel the day before or after the holiday. The roads and skies are at their busiest. Add any problem to the formula (weather for example) and it can mean big delays whether at an airport, train station or on the highway. If you’re one of the people who arrives at the airport or station only 30 minutes before takeoff; you need to change your routine for holiday travel plans. There will be longer lines to park, check luggage, and get through security. Any delay can mean missing your flight and with planes overbooked you probably won’t make it in time for turkey. We most likely won’t be taking the most direct road driving to the Midwest next month. That’s because it goes right through Denver where Winter weather can be as tough as a composite door. The Southern route might be longer but it’s unlikely to have a blizzard. Be just as mindful when booking flights. The best option is a nonstop flight but if you must change planes, try to avoid cities that regularly have problems such as Chicago or Denver. We won’t decide which highway we’re taking in December until a day or so before we leave after checking the latest weather forecasts. You can’t be that flexible with air or train travel, but you can change how you celebrate. Instead of having Thanksgiving dinner in November avoid the holiday prices, crowds and weather with a celebration in the spring or summer. Another idea is to change the destination for all. We’ve taken cruises with our extended family so we all enjoy the warm Caribbean and no one has to cook! Whatever you decide, safe travels to you and your loved ones. What are your holiday travel tips? Our family is all local so thankfully we never have to worry about air travel. The problem we run into is that our families are on opposite sides of town, so there’s a LOT of driving and such involved and it makes for a very long day, something that we’re not looking too forward to given that we have a two year old and a five month old, both who can get pretty crabby when their naps are interrupted! Maybe you just have to hold the dinner and have both sides come to you. I know how hard it is with tired kids. Normally we have people travel to us. This year, none of our family is coming here, so it’s a locals only holiday season. I am a big fan of celebrating at a time that is convenient for the family, not necessarily when the calendar says we should celebrate. Why add stress when there’s no need to? I totally agree. Plus, it’s so fun to have the Thanksgiving feast at an unpredictable time of year. Some great ideas… may I add one? Take a moment to stop somewhere unscheduled that you find along the way… adds some variety and new experience to what might be a regular, predictable trip to the family (if that’s where you go). We decided to go on our own vacation this year and skip the entire holiday tradition. Our family was cool with it, and we spend a lot of time with them throughout the year anyway. So we are going off on our own little family vacation, and kicking the turkey and dressing to the curb. Sometimes it is nice to jilt the system and do your own thing! For Christmas, family travels to us and every other year, we host Thanksgiving as well. When we used to travel to NY, we adjusted our travel days so we were driving on Tuesday and Saturday (we stayed longer to spend extra time with family) and we drive at night. Driving at night means less traffic and my daughter might sleep. This year, though, I think we’re doing our own thing. Staying home, just the 3 of us and our pets. No traveling, no stress. Just the way it should be! Ha Great article!! I’m finding lots of great tips online and hope it will be a smooth holiday season for my traveling family!! It may seem insignificant to some, but for my family and me, making sure everyone is comfortable, well-fed and entertained is a big deal. We always have the snacks and a pretty big vehicle, but en route entertainment was always a hassle, as we were forced to bring portable DVD players, cords, batteries, movies and more along for the ride. Now, thanks to my TV Everywhere through work at DISH Network, we have a veritable entertainment center on my iPad!! I got the Free DISH Remote Access App for the iPad, and can now use my Sling Adapter at home to pipe all my live TV channels and DVR into my device!! The kids can relax to a movie, on a device that doesn’t crowd the back seat. I can keep up with the games and wife can keep an eye on the Weather Channel!! It saves us room, and considerably lessens the stress level during the long drives!!! I would highly recommend this for families on the move!! Weekly Roundup 11-14-11: Best of the Best!